Available in sizes 10" - 28"
These red Twister 400 grit pads are constructed to be used for heavy duty cleaning and should be used on worn concrete floors. The pad will effectively remove scratches and stains, thus leaving a nice matte surface in prep for using the white, yellow, and green twister pads. Due to the abrasiveness of this pad, the red pad should only be used with water at low speeds (up to 350 rpms). The Twister pads provide an innovated solution to cleaning your floor while reducing waste and saving you money. They can be used on a wide range of floors, including polished concrete, terrazzo, marble, vinyl, rubber, and more. Built with billions microscopic diamonds, these pads clean and polish floor at the same time. 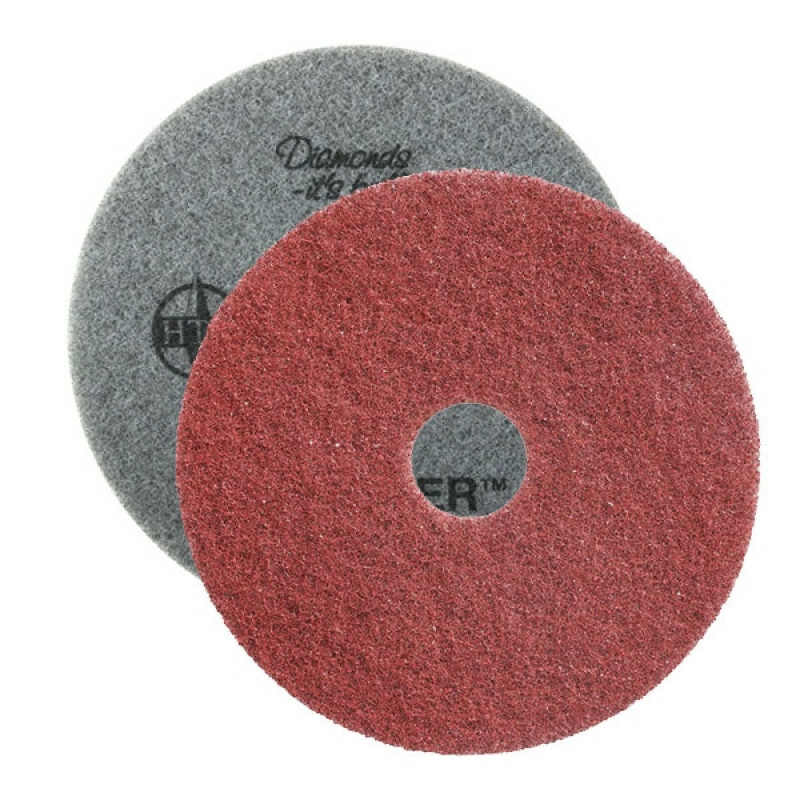 These pads also require no chemicals while buffing and typically are used with water depending on the pad and the speed of the machine. When used daily, the pads will give the floor a mechanically densified surface that will create resistance to dirt and wear while increasing slip resistance, which all will create a safer surface for anyone walking on it. Using Twister pads require no additional equipment and can be used with your current floor buffer or floor scrubber. Thanks to not requiring chemicals and featuring a life span three times that of a traditional pad, these pads can potentially save you up to 66% on your consumable spending. If you own a rectangular buffer or scrubber, look to our rectangular Twister red pads. This red pad is part of our starter kit which comes with all the different Twister pads that one should use during this restoring process. For a complete rundown of when to use each specific pad, please view our Twister pad guide page. Pads should only be used colored side down only and should be replaced when the backing starts to show through. Customers who were interested in the Red Twister™ Diamond Concrete Prep Pads - 400 Grit - Round (10" - 28") - Case of 2 were also interested in the following items. This is a review for the Red Twister™ Diamond Concrete Prep Pads - 400 Grit - Round (10" - 28") - Case of 2.